PhD student Sean Campbell receiving the ISHS Young Minds Award at the second World Beverage Conference. Campbell won the Young Minds Award for his presentation entitled, “Estimation of leaf chlorophyll content of butterfly pea (Clitoria ternatea) as a function of fertilization utilizing a nondestructive, hand-held spectral analyzer.” In addition to traveling to China, Campbell had the opportunity to explain the characteristics of the butterfly pea tea plant and how its unique characteristics could impact the beverage crop industry. 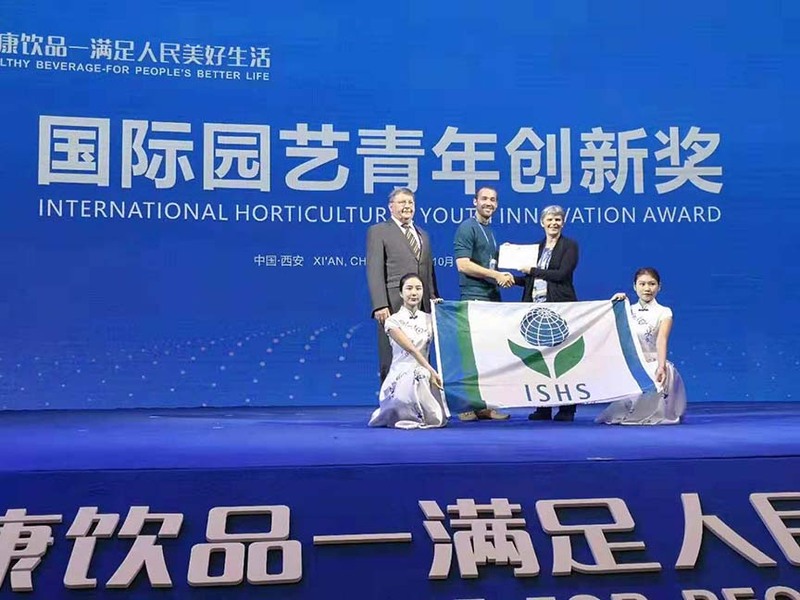 Read more below about Campbell’s interest in the butterfly pea tea plant and his experience at an international conference. 1. What do you want to learn more about in butterfly pea tea? Well, I kind of want to get away from associating it so much as a tea. In reality, using it as a “tea” is a super small aspect of the plant’s use. We more study the plant for its use as a vibrant natural colorant and for its elevated concentrations of the powerful antioxidant anthocyanin, a type of flavanoid in plants that appear to be red, blue or violet. I’m very interested in investing in novel plants with unique applications though, given the flower’s color changing ability it should become more and more popular as a cool new way to make a beverage. 2. Why does the leaf chlorophyll content help you understand the plant better? Chlorophyll content can be directly correlated to the nutritional quality of the plant. By better understanding this relationship we can help growers develop ways to non-destructively assess their plants health and optimize their fertilization regime. Sean Campbell and his graduate advisor Brian Pearson, PhD, visited the Great Wall of China during some free time while attending the conference. 3. Why do you want to learn about this particular plant? It just struck me as a particularly cool crop since it nicely fits both the beverage and medicinal categories of our research at the UF/IFAS Mid-Florida Research and Education Center. 4. How does it feel to have won the ISHS Young Minds Award? Incredible, it’s such an honor to be recognized on that kind of international level. I only hope it will open up more opportunities in the future. 5. How was your experience in China at an international conference? How did it differ from a conference in the US? It was rather different than anything I had ever experienced while conferencing in the US, mainly because of the level of hospitality. They worked very hard to ensure every attendee was well taken care of, going as far as to provide local volunteers as personal conference guides. This made the experience much more enjoyable as communication never really became an issue. 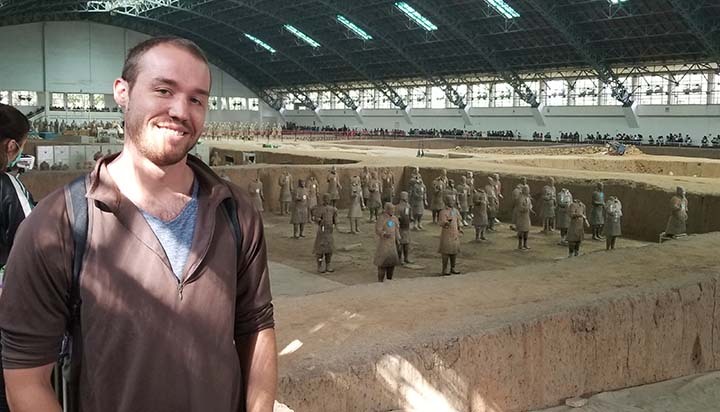 Here Campbell and Pearson are accompanied by a volunteer guide from the World Beverage Conference to better understand the Chinese culture and historic sites. 6. Would you suggest other students to attend academic conferences? Yes, definitely. I cannot over emphasize how valuable of an experience it was. 7. What one thing surprised you about China? The sheer size of it. It’s somewhat surreal to be in a city with a population of 12 million and hear it referred to as “small. 8. What sites do you suggest people to see if they want to visit the country? We were fortunate enough to see the Terracotta Warriors, the Forbidden City, the Great Wall, the Summer Palace, and the Temple of Heaven. I would say any of those are great places to start. Campbell also had time to visit the Terracotta Soldiers during his time in China. 9. Is there anything else you want to add about your experience in China about the conference or your experience as a tourist? Kind of a funny thing but probably my favorite part was the random locals approaching us for pictures. I’ve never felt like such a celebrity for doing nothing at all. Sean Campbell is a PhD student under the advising of Brian Pearson, PhD, in the College of Agricultural and Life Sciences for the Department of Environmental Horticulture. Both Campbell and Pearson are based at the UF/IFAS Mid-Florida Research and Education Center in Apopka.